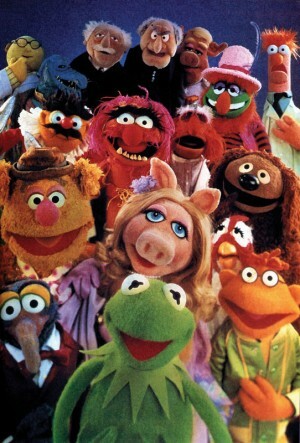 I saw the new Muppet Movie tonight. It was good. Not as good as the original, but still full of plenty of laughs, 80’s references and a whole lot of nostalgia. Why are there so many songs about…. Me: Do you remember which bag has the big tree in it? Hubby: You know what would be nice? Hubby: Going to the store and buying another tree instead of wrestling one of those down. The scary thing about this is that I was thinking something along those lines before he said it. The even scarier thing – we did this one year. We bought a really skinny, super cheap tree that was about three feet tall rather than wrestle the larger tree down from the attic. Problem? Solved. Right now my arms itch from fluffing the limbs, the top of the tree is listing because I had to use tape to get the top and bottom piece to stay together, and the middle section of lights is out (it’s a pre-lighted tree). I have no idea how a tree can break itself in the attic. I blame the ancient aliens. Pulling her coat closer around her Sarah looks left then right. She scans the crowd for the red jacket she glimpsed out of the corner of her eye. Her heart beats faster. Stephen? Here? She’s tempted to shout his name. Would he welcome the intrusion or recoil from her in disgust? A light drizzle begins to fall from the gray, overcast sky. The man in the red jacket turns and scans the crowd. She puts her hand on the door of the shop and struggling tugs it open. Stephen slowly turns and continues walking. She breathes a sigh of relief. 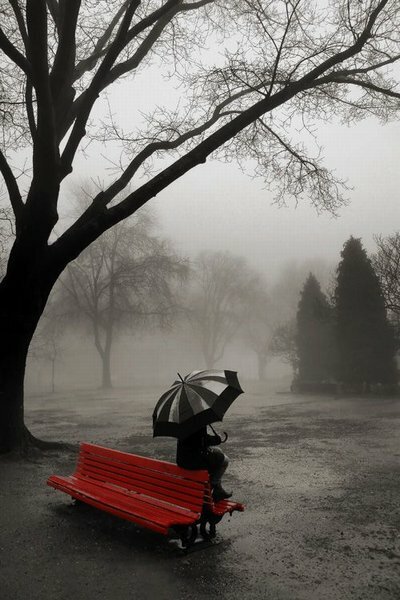 photo from http://thesavageworld.wordpress.com/2011/04/12/rainy-days/ If anyone knows the original artist, please let me know! It’s turkey day weekend wrap up here on the blog. Firstly, I’m amazed that I’ve made it this far in the NaBloPoMo self-challenge. A couple of flubs, yes, but overall, I’ve done really well. I’m patting myself on the back right now. I had a great weekend. I loved spending so much quality time with my husband and family. I guess we needed it because we’ve certainly seemed happier and closer with the extra time spent together over the four day weekend. I heard before that 10 hours a week is a good amount of time to devote to your spouse. I can’t vouch for that. But I know we both feel more rested – yea! sleeping in – and better about things after the weekend. We still haven’t gotten up the Christmas decorations. It’s on the list for tomorrow but will drag out into a week long effort I’m sure. I managed to see quite a few movies this weekend including Hugo (a great fantasy adventure with a tender and touching story), Six String Samurai (crazy post-apocalyptic romp with child that screams instead of speaking for most of the movie), and X-Men 1st Class (better than the last few X-Men movies). I like the movies, but I do enjoy doing a lot of other stuff too and can’t sit and watch marathons like the better half can without getting antsy. If you know me, you know I don’t do sitting down and being still very well. Even at a tender age, I had to be moving and doing something and forget nap time. Sorry, parents of mine. I know I must have been a handful. Speaking of being a handful I just remembered the time we picked on our teacher at day care mercilessly. Man, kids can be pretty darn mean. I’ll have to write more about that later. Also, had a couple of great trips to the coffee shop and some random drives around in the vain attempt to find some Christmas lights. Probably a bit too early for that, eh? Okay, that’s all for now. Five minutes goes by darned quick! Visit your fellow bloggers and show some love. Other participating bloggers can be found at All.Things.Fadra.